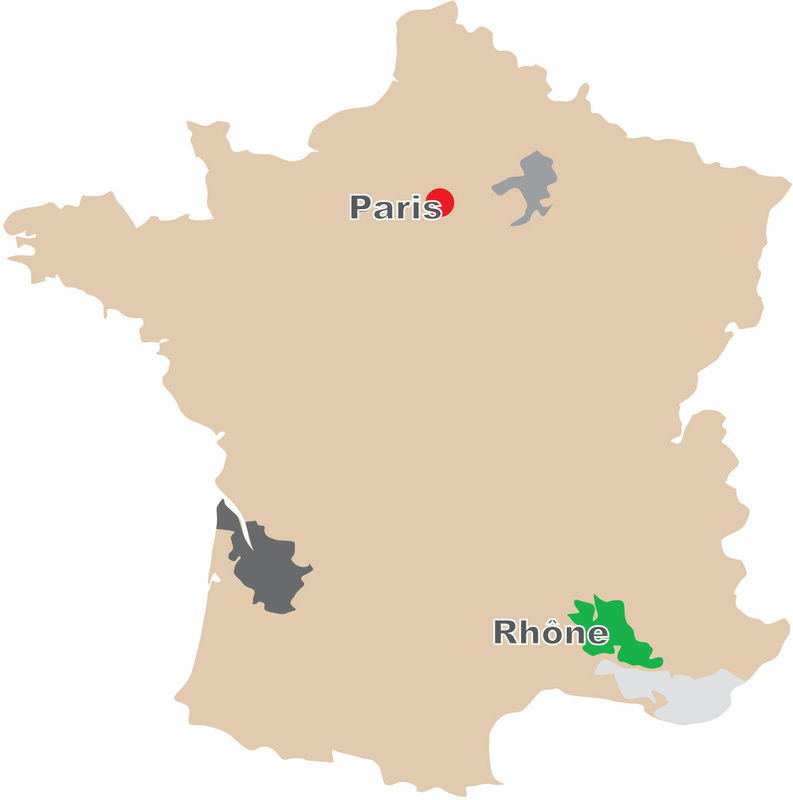 Rhône valley is a key wine-producing region in the south-east of France. It consists of a variety of soil types. Mistral wind in the southern Rhône can have a cooling effect but it can also damage vines. South-facing slopes in the Northern Hemisphere and north-facing slopes in the Southern Hemisphere are exposed to more direct sunlight than opposite slopes and are therefore warmer for longer time. The soil of the valley consists of different types of rocks, mainly granite in the north, and ‘pudding-stone’ pebbles in the south especially in some parts of Châteauneuf-du-Pape. The majority of grapes are grown on steep sloped vineyards in the north, while vineyards in south are mostly flatten vineyards. The typical Rhone reds are lighter in style, while the whites are bone dry without obvious fruit due to lower heat and lesser sunshine. The most commonly known wines are from Châteauneuf-du-Pape, with other areas such as Luberon and Gigondas being the rising stars. The key red grape for North is Syrah, and white grapes Viognier, Roussanne and Marsanne. While for South the key red grapes are Grenache, Syrah, Mouvedre and Cinsault, and white grapes Grenache Blanc and Clairette.